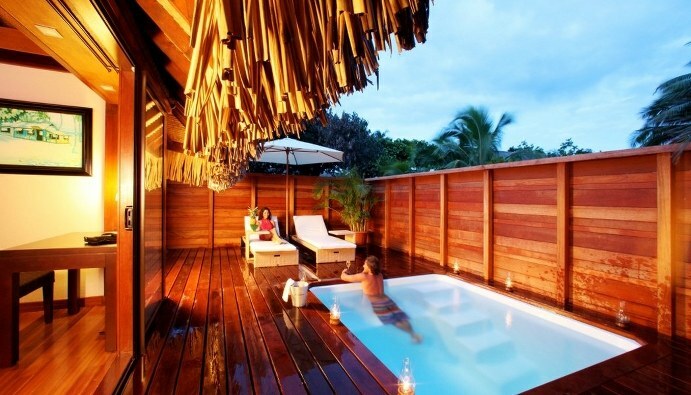 These bungalows have been refurbished in 2009 to include a private pool and a large sun deck. 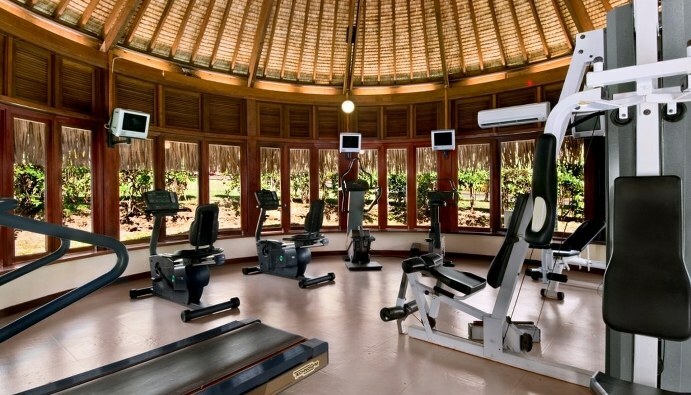 Decorated in a contemporary Polynesian style and featuring the most modern amenities, bungalows are connecting units that can be booked separately and located in the gardens towards the back of the resort. Each room can hold up to 3 adults or 2 adults and 2 children in 1 king bed or 2 single beds plus a sofa bed and the option for a rollaway bed to be brought in. Stocked minibar at arrival including a selection of soft drinks, beers and bottles of water. Daily Free refill. Larger than Garden Bungalow with Pool these bungalows are stand-alone buildings not a duplex unit as the standard garden bungalows. 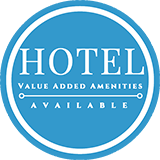 Rooms are located close to beach or pool and each have their own private plunge pool and terrace where you can relax and enjoy your beautiful accommodations. 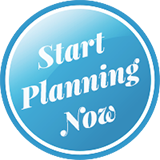 Each room can hold up to 3 adults or 2 adults and 2 children in 1 king bed or 2 single beds plus a sofa bed and the option for a rollaway bed to be brought in. Stocked minibar at arrival including a selection of soft drinks, beers and bottles of water. Daily Free refill. 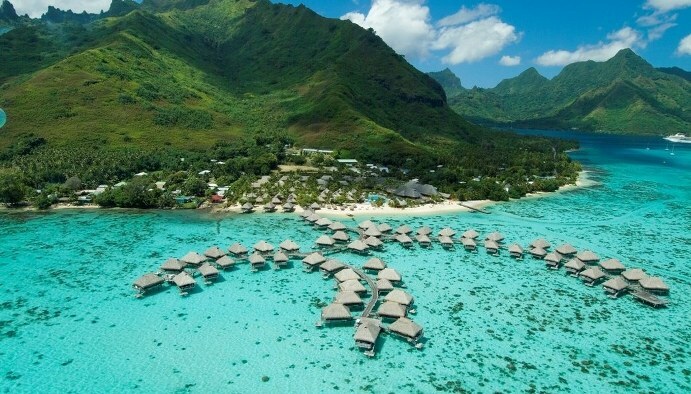 Nestled between beach and lagoon, these units overlook the incredible Moorea Lagoon and the resort Overwater Bungalows and are located not too far from restaurants and public areas. 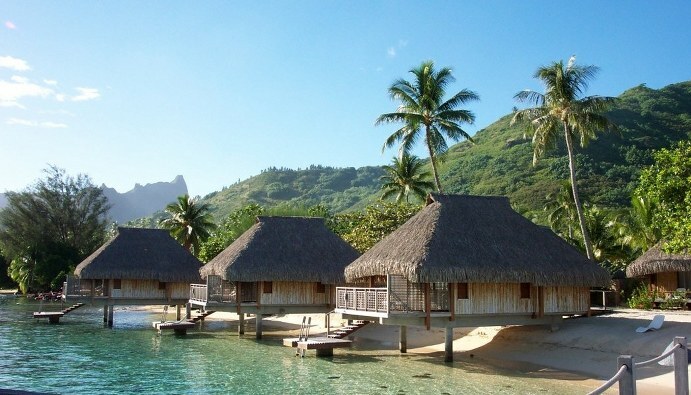 Decorated in a Polynesian style, these bungalows are featuring the same room facilities as other categories. 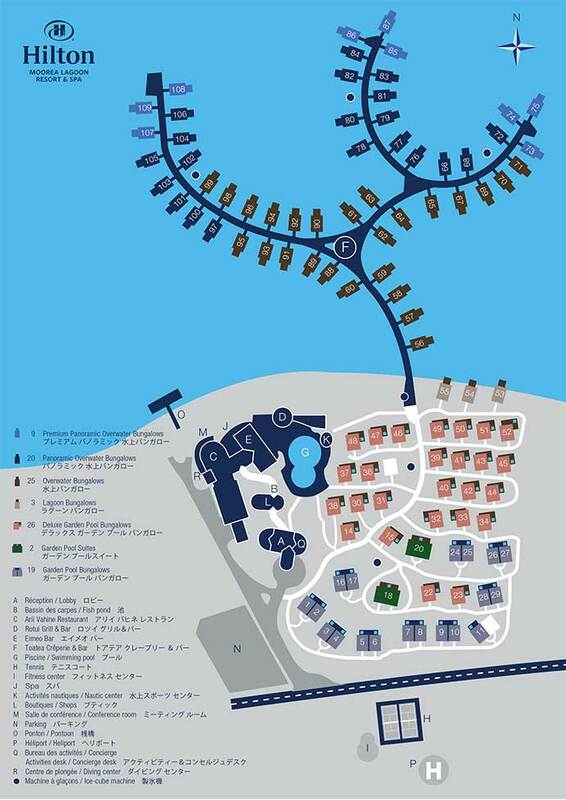 Each room with sleep 3 adults or 2 adults and 2 children with 1 king bed and a sofa bed and an optional rollaway bed. 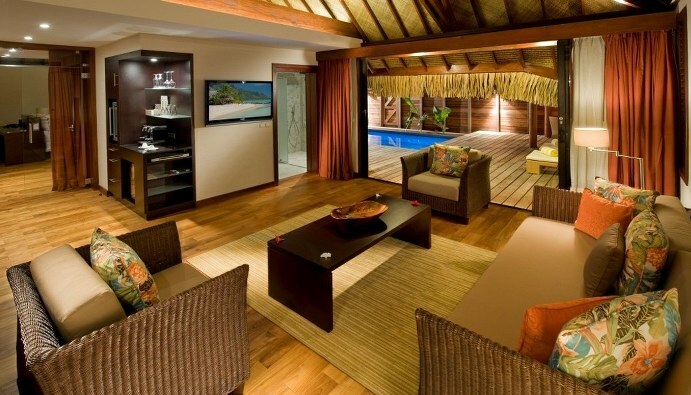 Each bungalow also has a private ladder down into the lagoon. Stocked minibar at arrival including a selection of soft drinks, beers and bottles of water. Daily Free refill. Discover the rich and multicolor underwater fauna either through the glass floor comfortably seated on the sofa, from the deck of your bungalow or snorkeling in the shallow water around your bungalow thanks to the direct access to the lagoon. 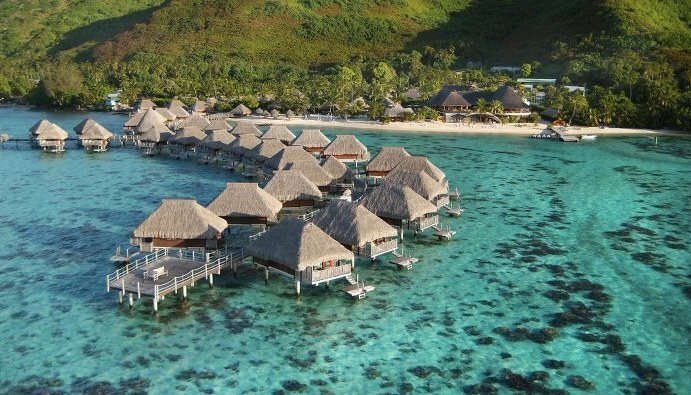 These overwater bungalows give you Polynesian décor and comfort with the ability for easy access to the warm Moorea lagoon. 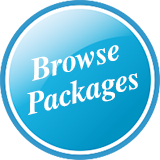 Each bungalow will accommodate 3 adults or 2 adults and 2 children in 1 king bed and 1 sofa bed. Stocked minibar at arrival including a selection of soft drinks, beers and bottles of water. Daily Free refill. 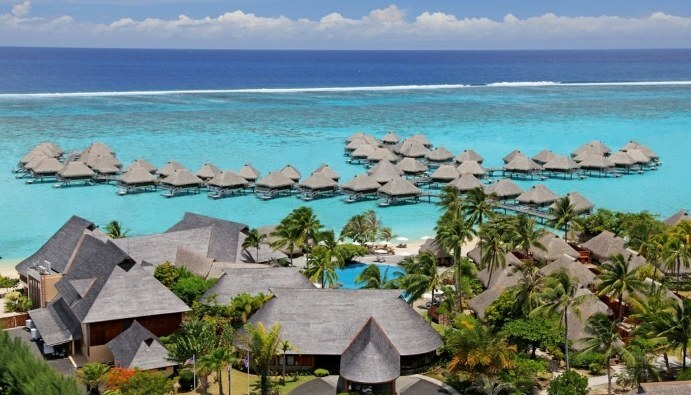 These bungalows are offering the best uninterrupted panoramic view on Moorea lagoon with direct access to the warm turquoise waters from the deck. 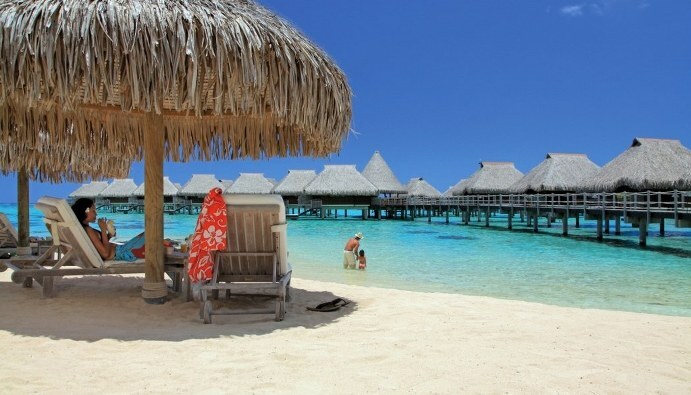 With the same great features as the Overwater Bungalows but the added view, don’t be surprised if you never want to leave your own bungalow. 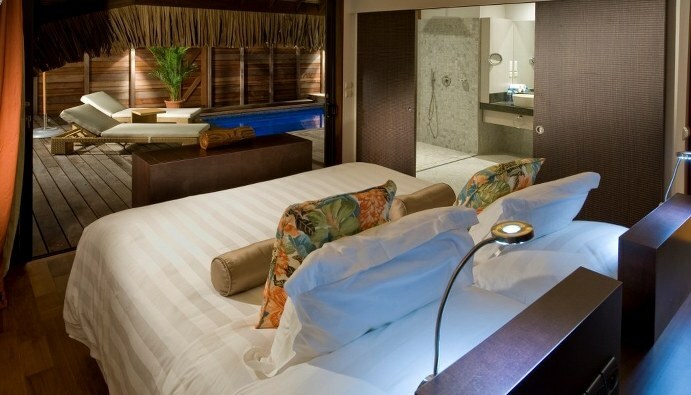 Each bungalow will accommodate 3 adults or 2 adults and 2 children in 1 king bed and 1 sofa bed. Stocked minibar at arrival including a selection of soft drinks, beers and bottles of water. Daily Free refill. 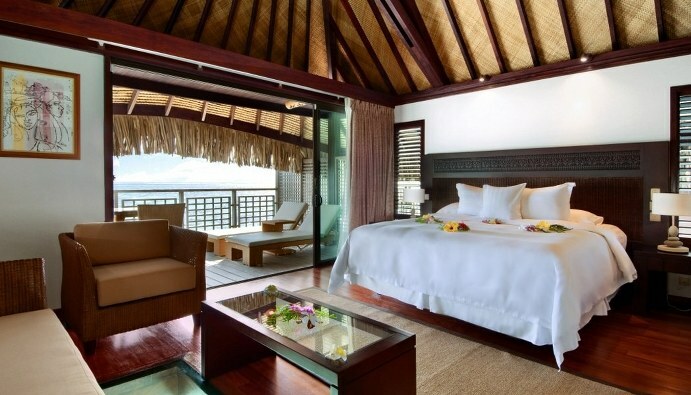 These bungalows feature the same configuration and equipment as the Panoramic Overwater units except that they are located at the end of the 3 overwater bungalows branches, enjoying the best views. Maximum Occupancy 3 Adults. Bed Configuration: 1 King size bed + 1 Sofa bed. Stocked minibar at arrival including a selection of soft drinks, beers and bottles of water. Daily Free refill. 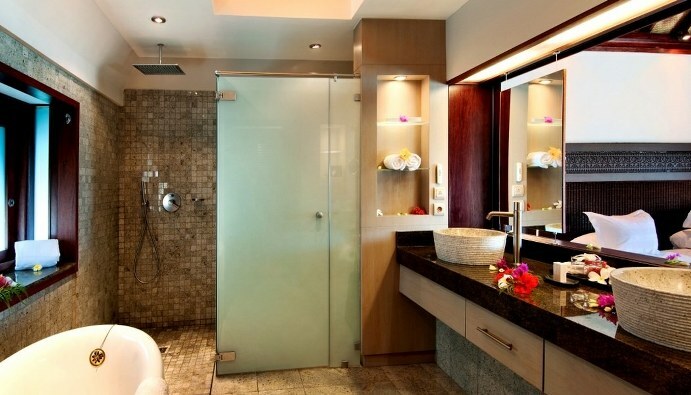 This spacious suite features a separate double room and a large living room. 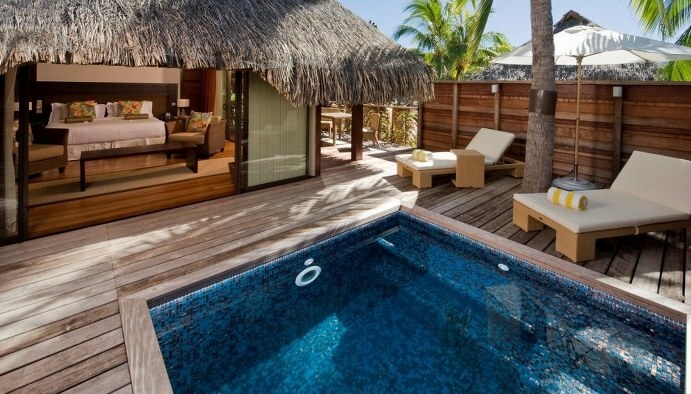 Enjoy the tropical sun on you private deck with gazebo and plunge pool. The Garden Pool Suite will accommodate 3 adults or 2 adults and 2 children in 1 king bed and 1 sofa bed with an optional rollaway bed. Stocked minibar at arrival including a selection of soft drinks, beers and bottles of water. Daily Free refill. TOATEA BAR & CREPERIE, in the center of the pontoon of the overwater bungalows, Bar and Crepes. 18H30 – 22H00. Reservation required. 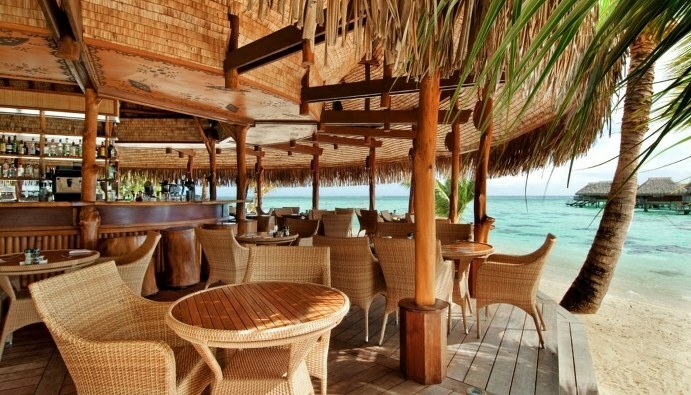 ROTUI Bar on the beach 10H00 – 22H00. Happy Hour from 17h00 to 19h00 on Champagne cocktails. EIMEO Lounge Bar 16H00 – 22H00. Happy Hour from 16H00 to 19H00 on Rum-based drinks. 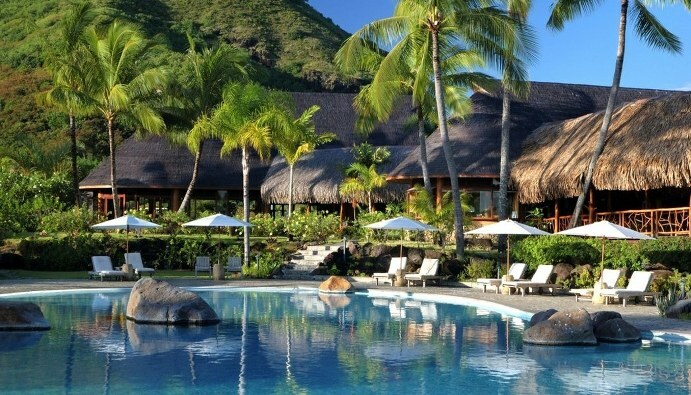 Moorea Lagoon Spa, 08H30 – 19H00 : located beachside, the Spa offers 4 cabins among them 2 designed for couple treatments & free access to the hammam & sauna for resort’s guests. 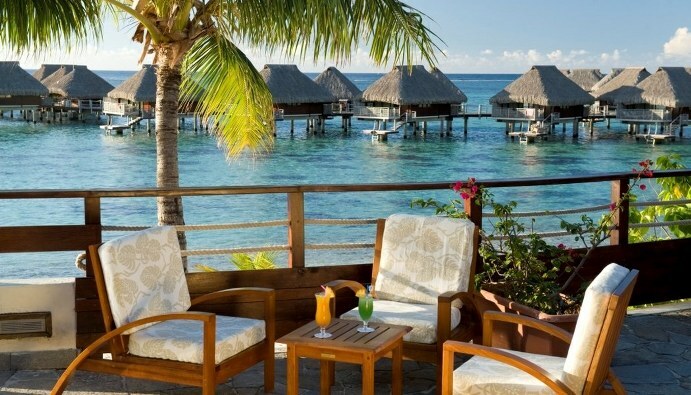 Nestled between two bays on the heart-shaped island of Moorea, just 17 km across the Sea of Moons from Tahiti’s capital Papeete, the Hilton Moorea Lagoon Resort & Spa is set against a stunning mountain backdrop which melts into a crystal clear lagoon. The unspoilt beauty of this verdant paradise, also known as the ‘Island of Love’, was the inspiration for many works by French Impressionist, Paul Gauguin. 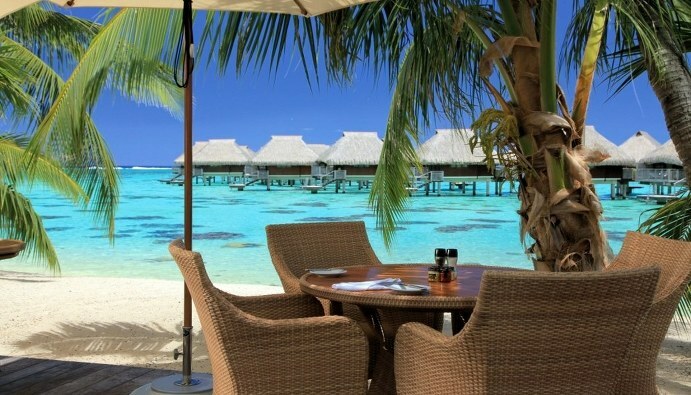 Featuring contemporary Polynesian design, this Moorea resort’s luxurious bungalows are set amidst exotic flower gardens or suspended above the turquoise lagoon, teeming with tropical marine life. 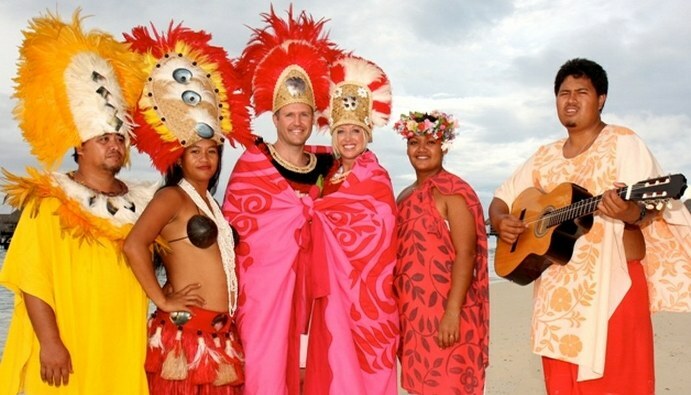 Sample Polynesian and international cuisine from a choice of themed menus, buffets and delicious à la carte dishes. 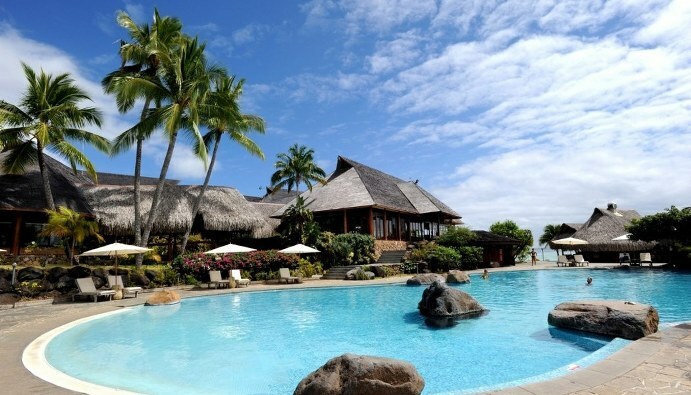 The islands only all bungalow resort set in a great central location. 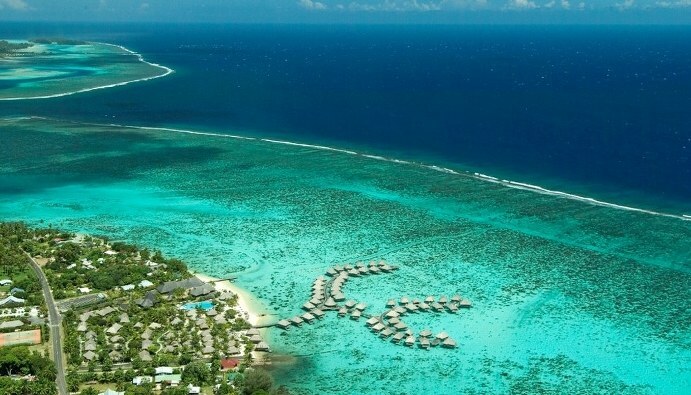 Snorkeling fans will love the fish and coral you can see right from the beach or your overwater bungalow. 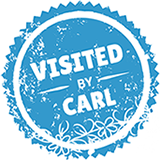 The friendly warm staff are sure to be another lasting memory of your stay.